A few weeks ago, San Joaquin River Parkway and Conservation Trust and Young Chef's Academy paired up for a fun evening of cooking and playing games, all while their parents went out on a date night. According to Young Chef's Academy's chef Shayna Telesmanic, "We had a wonderful time! The kids shook it to Taylor Swift's "Shake It Off" to make ice cream In a Bag.They also made pizza from scratch and eggless, edible cookie dough." 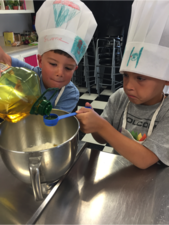 On July 15th, parents dropped their kiddos at Young Chefs Academy for two hours of fun in their kitchen, while the parents enjoyed an evening out. At the Academy, the children made homemade ice-cream and edible cookie dough for sundaes, as well as personal size pizzas from scratch. They also played some easy games geared to all children. Children took home the recipes they made so they can make the treats again at home. Hopefully they can teach their parents a thing or two, as well! Established in April 2003, Young Chefs Academy offers cooking classes to children in a safe environment that encourages discovery and creativity. While learning food preparation skills is the main ingredient at YCA, each class adds a heap of kitchen safety, a scoop of etiquette, a handful of table setting, a pinch of menu planning, and laughter to taste. Julie Burleson, founder of YCA, believes this is the perfect recipe for showing children cooking is a lifelong skill that can be artistic, creative, and fun. The welcoming environment provides a "real" setting so that the students can take what they learn at YCA to their own homes. "The kitchen is the pulse of the home... where we learn about life and each other," says Burleson. Young Chefs Academy nourishes those values and gives kids an innovative environment to learn and thrive. In this busy world, what could be better? To learn more about Young Chef's Academy, visit their website. The River Parkway Trust offers a variety of services in our three program areas of Conservation, Education, and Recreation. The River Parkway Trust provides a wide range of program services to protect and restore the San Joaquin River. Experience Fresno's backyard by exploring the beautiful surroundings and abundant outdoor recreation opportunities along the San Joaquin River. See a variety of wildlife and learn how the river and ecological reserves benefit our neighboring communities. To learn more about the San Joaquin River Parkway and Conservation Trust, visit their website. Interested in joining in the next Party for the Parkway? Visit their Facebook page to find out what's next!